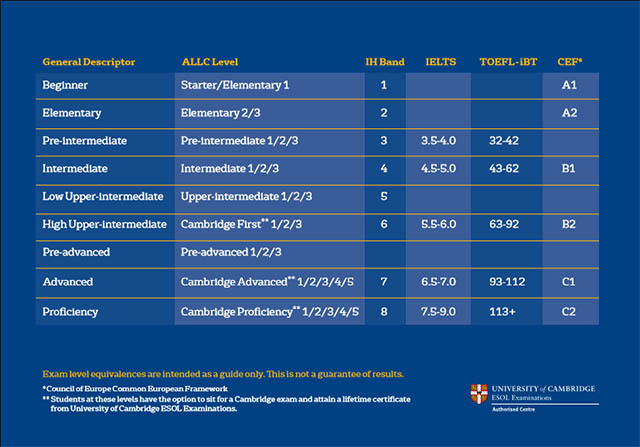 Before placing you in a class we ask you to complete our English language placement test. The test can either be done online – this is then followed by a short face to face speaking test at our centre, at which point we will recommend a course of learning to suit your needs. Alternatively, you may choose to complete the whole test at International House Beirut in Sin el Fil. At IH Beirut, we base our classes on the Common European Framework of Reference for Languages (CEFR) to differentiate levels of ability for the English language. To ensure that you are placed in a class with other students of a similar English ability, we sub-divide the CEFR levels. Our experience is that students learn more quickly and more efficiently if placed in a class with other students of a similar English level; no one is left behind and no one is held back.